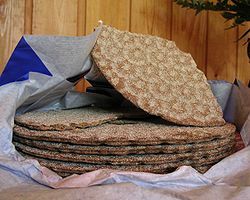 Crispbread (Swedish: knäckebröd, hårt bröd, hårdbröd, spisbröd, knäcke, Danish: knækbrød, Norwegian: knekkebrød, Finnish: näkkileipä, Estonian: näkileib, Icelandic: hrökkbrauð, Faroese: knekkbreyð, German: 'Knäckebrot' or 'Knäcke', Low German: Knackbrood, Dutch: knäckebröd) is a flat and dry type of cracker, containing mostly rye flour. Crispbreads are light and keep fresh for a very long time. Crispbread is a staple food and was for a long time considered a poor man's diet. However, in recent years there has been renewed interest in crispbread in the Nordic countries. Crispbread has been baked in central Sweden since 500 AD (CE). It was made as round wafers with a hole in the middle so the bread could be stored on sticks under the roof. Traditional crispbread was invented about 500 years ago. Finland and Sweden have long traditions in crispbread consumption, and crispbread has been known in most households since the 1800s. Traditionally, crispbreads were baked just twice a year; following harvest and again in the spring when frozen river waters began to flow. 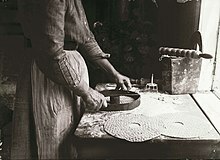 Traditional western Finnish crispbread was (and still is) made in the form of a round flat loaf with a hole in the middle to facilitate storage on long poles hanging near the ceiling. Sweden's first industrial crispbread bakery, AU Bergmans enka, began its production in Stockholm in 1850. Rectangular Knäckebrot was first manufactured in Germany in 1927 and has remained popular and readily available there ever since. Crispbread traditionally consists of wholemeal rye flour, salt, and water. Today, however, many kinds of crispbread contain wheat flour, spices and grains, and is often leavened with yeast or sourdough, and milk or sesame seeds can be added. In the case of unleavened crispbread, bubbles are introduced into the dough mechanically. Traditionally, this was done by mixing snow or powdered ice into the dough, which then evaporated during baking. Today, the dough, which must contain a large amount of water, is cooled and mixed until bubbly. Another method is to knead the dough under pressure in an extruder. The sudden drop in pressure then causes water to evaporate, creating bubbles in the dough. Crispbread is only baked for a few minutes, at temperatures usually between 200 and 250 °C. ^ Jan-Öjvind Swahn (2003). Mathistorisk uppslagsbok. ISBN 978-91-89086-49-4. ^ Edwards, W. P. (2007). The science of bakery products. Cambridge: Royal Society of Chemistry. p. 188. ISBN 978-0-85404-486-3. This page was last edited on 18 March 2019, at 01:16 (UTC).